The No. 20 Iowa Hawkeyes took down the Northwestern Wildcats 80-79 on Sunday night in Iowa City. 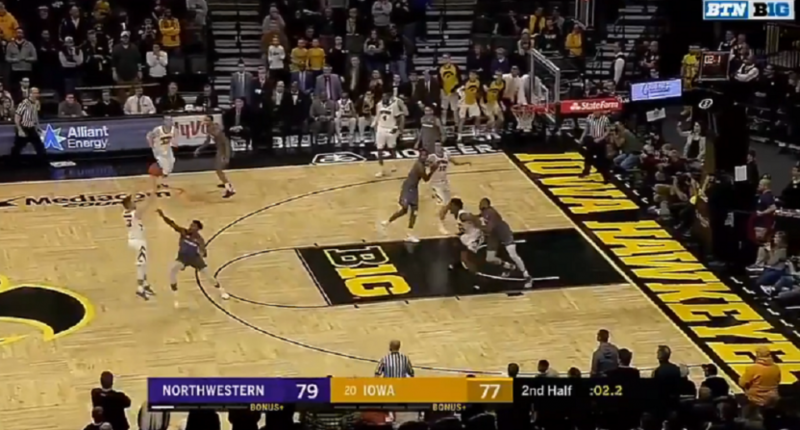 You could call it an amazing comeback by Iowa, and you could call it an amazing meltdown by Northwestern. Northwestern had a 15-point lead with 4:15 remaining, and an 11-point lead with 2:05 remaining. The Wildcats had a 99.1% win probability when they went up by 15 with 4:30 remaining. Iowa moves to 19-5 and 8-5 in Big Ten play with the dramatic victory, while Northwestern falls to 12-11 and 3-9 in Big Ten play with the crushing loss.